Two people were killed and 182 were hospitalized after Asiana Airlines Flight 214 from Seoul, South Korea, crashed and burst into flames at San Francisco International Airport, forcing passengers to jump down the emergency inflatable slides to safety. 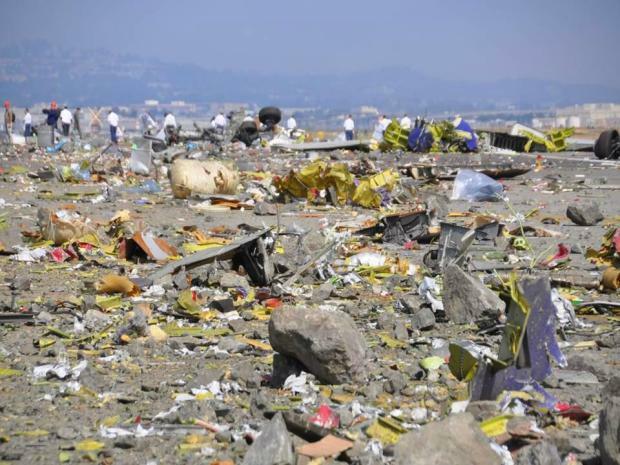 The Boeing 777 with 307 people on board crashed as it was landing on Runway 28 Left at SFO at 11:27 a.m. PDT. Two people who were found outside the wreckage died in the crash, both Chinese female teenagers seated at the back of the plane, the President of Asiana Airline said in a press conference in Seoul. Autopsies will be performed today on both victims. 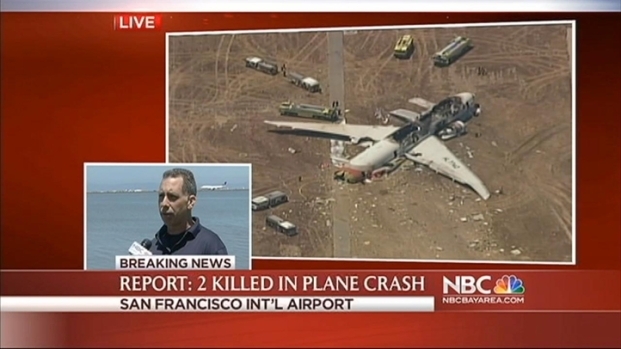 SFO officials said 182 people were transported to area hospitals, 49 of those with critical injuries. Initially, 60 people were considered unaccounted for, but San Francisco Mayor Ed Lee confirmed at a 7:45 p.m. press conference that every one on board the plane had been accounted for. "This could have been much worse," Lee said. "We are very lucky that we have so many survivors, but there are many who are critically injured. Our thoughts and prayers go out to them." 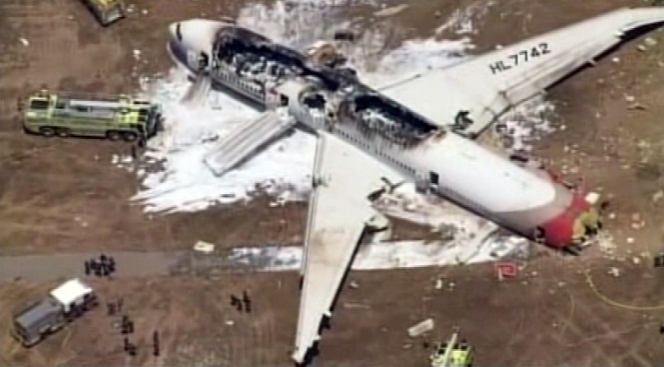 Eyewitness Brian Piper describes what he saw when an Asiana Airlines plane crash landed at SFO. Federal investigators said it was too early to determine a cause. A representative of the National Transportation Safety Board arrived on scene late Saturday and took control of the investigation. The sources who spoke with NBC News said the pilot did not make a distress call before landing. The plane crashed in favorable weather — partly cloudy skies and light wind. 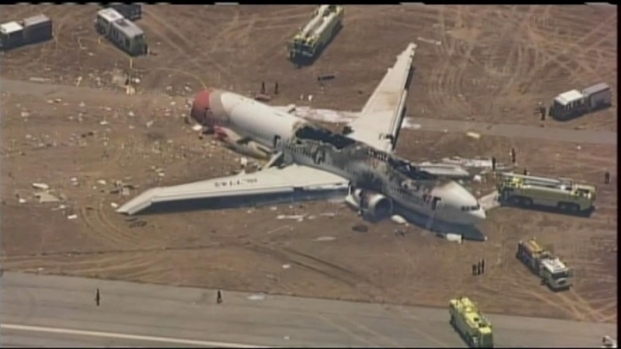 Asiana Airlines Flight 214 crashes at SFO. Raw video from our chopper of the aftermath of the crash. SFO officials said a total of 307 people were on board, 291 passengers and 16 crew members. Asiana Airlines reports the passengers included 77 Koreans, 141 "of Chinese descent," 61 U.S. citizens, three from India, one Japanese, one from Vietnam, and seven of unknown origin. "It was a bit surreal," said Flight 214 passenger Benjamin Levy, "a lot of people screaming, not believing what was happening. I couldn’t believe it either." Helicopter video of the scene showed a large plane with severe burn damage to its midsection. The tail section was detached. Runway No. 28 was strewn with debris. The line of debris stretched to the bay. A firewoman was onboard the plane before all the passengers were evacuated, Levy said. At least two passengers came out of the water -- although the plane was not in the water -- when firefighters arrived on the scene. It is possible they sought out the water to deal with flames or burns. Nine Bay Area hospitals attended to victims of the crash. San Francisco General Hospital received 52 patients from the crash, a hospital spokeswoman said. The hospital received four waves of patients, including an initial wave of 10 critical patients, hospital spokeswoman Rachel Kagan said. Of those initial 10, two were children. Stanford's Lucile Packard Children's Hospital treated 45 patients. Sixteen of those were admitted. Three of those were in critical condition and 10 were in serious condition as of a 7:45 p.m. update. Flights in and out of SFO were suspended for about four hours. Two of the airport's four runways were reopened by 3:30 p.m., allowing limited service, according to SFO. Airport spokesman Doug Yakel said the airport's other two runways will not reopen until NTSB investigators give approval. Arriving flights were being diverted to Oakland, San Jose, Sacramento and Los Angeles. Extra staff and shuttle buses were on hand at Mineta San Jose International Airport to handle the 27 planes that were rerouted there from SFO. The flight, which originated from Shanghai, China, left Seoul's Incheon International Airport 10 hours and 23 minutes before its crash landing, according to FlightAware, a website that tracks air traffic control. The website reports a total of 242 flights originating at SFO and 186 scheduled to land at SFO were canceled. NBC Bay Area spoke with passenger Levy shortly after the crash: “We were approaching perfectly well, but we were too low, when the pilot realized it, he put some more gas to correct it, but it was too late, so we hit the runway pretty bad, and we started going up in the air again, and we landed pretty hard.” NBC Bay Area's full interview with Levy is posted below. Federal sources told NBC News that there was no indication of terrorism. President Barack Obama has been made aware of the situation, according to White House officials. U.S. Department of Transportation Secretary Anthony Foxx and Federal Aviation Administrator Michael P. Huerta released a joint statement in response to the crash: "The Department of Transportation and the FAA are working closely to assist the NTSB with its investigation. Our thanks go to today's first responders and our thoughts and prayers go out to the passengers and crew of Asiana Flight 214 and their families." National Transportation Safety Board investigators arrived on the scene in San Francisco late Saturday night, according to NTSB's Twitter feed. In a statement, House Minority Leader Nancy Pelosi said, "Our city is immeasurably grateful for the swift response of the flight crew who quickly evacuated passengers; for the air traffic controllers who effectively diverted traffic; for the brave first responders and the hospital staff who are ensuring the swift recovery of the injured. Their actions are a testament to the strength, courage, and selflessness that defines the Bay Area." "We are grateful for the courage and swift response of the first responders whose actions surely prevented an even greater tragedy," said California Governor Jerry Brown in his own statement. Last year, SFO saw 317,000 takeoffs and landings of commercial airplanes, all without a fatality. There had not been a fatal accident at SFO in the past 75 years, until Saturday, NBC Bay Area's Stephen Stock reported. Facebook COO Sheryl Sandberg was supposed to be on the flight, but chose United instead. Taking a minute to be thankful and explain what happened. My family, colleagues Debbie Frost, Charlton Gholson and Kelly Hoffman and I were originally going to take the Asiana flight that just crash-landed. We switched to United so we could use miles for my family's tickets. Our flight was scheduled to come in at the same time, but we were early and landed about 20 minutes before the crash. Our friend Dave David Eun was on the Asiana flight and he is fine. Thank you to everyone who is reaching out - and sorry if we worried anyone. Serious moment to give thanks.